Latha Ramchand recently took on the role of interim dean at UH Bauer. On Bauer Business Focus — A conversation on building business leaders at UH Bauer College with Andrew Schneider, business reporter for KUHF 88.7 FM. With the nation rebounding from an economic crisis and looking to the corporate world for innovative solutions, training the next generation of business leaders to be effective problem solvers is critically important. 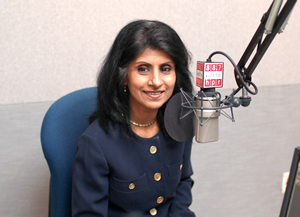 University of Houston C. T. Bauer College of Business Interim Dean Latha Ramchand recently stopped by Bauer Business Focus to talk about her vision for Houston’s leading business school. Ramchand took on the interim role earlier this month after serving as an associate dean for the college for three years and as a finance professor for 18 years, a position she still holds. (Read more). The college has seen unprecedented growth in recent years, she said, with national rankings in entrepreneurship and sales, along with significant faculty research, high levels of student job placement and expanded curriculum, including programs in energy, real estate and leadership. One priority will be to better connect Bauer College with the business community as a resource, with faculty and students lending their knowledge through case studies and outside-the-classroom application. The college is also looking to continue reaching out to business leaders, Ramchand said, to help develop curriculum that answers the need of local industry and prepares students to graduate ready to lead at every level in their companies and organizations. This type of real-world interaction will allow students to learn from the successes and failures of experienced business professionals.